NEC3 has already had a transformative effect on the industry. 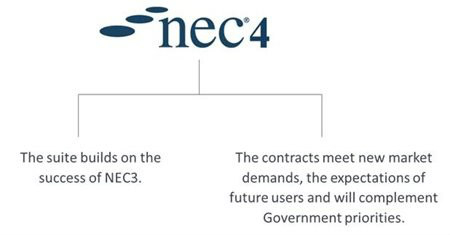 The adoption of NEC3 contracts put collaboration and collective risk sharing as the foundation for modern procurement. With high profile projects being procured under NEC3, such as the London 2012 Olympic and Paralympic Games, these contracts have proven that even large, high-risk, complicated projects can be delivered on time and within budget. Two brand new contracts have been added to the suite – NEC4 Design, Build and Operate Contract (DBO) and NEC4 Alliance Contract (ALC). NEC4 is suitable for procuring a full array of Works, Services and Supply, ranging from a major framework to small-scale projects. We provide advice and guidance to client organisations, in appropriate construction strategies, at an early stage to ensure value based outcomes from the project choices. Constructing Excellence hold the training franchise for New Zealand and uses approved NEC trainers to deliver all levels of training. The principal NEC3 contracts, short contracts and sub-contracts are can be broadly grouped into works, services and supply as shown below. The choice of NEC3 form depends on the project complexity and level of risk. Works encompasses purchases such as the construction, refurbishment and decommissioning of buildings, structures, process plants and infrastructure – including everything from houses, schools, hospitals and leisure facilities to infrastructure for water, energy, transport, industry and waste. Services includes purchases of professional services such as engineering, architectural, project management and consultancy works. It also covers composite services such as facilities management, cleaning, catering, security, maintenance and data processing. Supply includes supply of high-value goods and associated services such as transformers, generators, rolling stock, cranes, gantries and complex plant. It also includes lower-risk items such as building materials and products, stationery, personal protective equipment and parts.